The demand for police officers often depends on the ebb and flow of the crime rate in a given location, and some cities and states in the United States provide better opportunities for police officers who wish to find work. According to the Bureau of Labor Statistics (BLS), around 780,000 people work as police officers nationwide, and around 41,400 additional police officers will be needed on American streets in the next eight years. Not surprisingly, the state of California has more police officers than Wyoming with total police officers reaching over 68,000 versus 1,190 police officers in Wyoming. However, the populations in these two states are very different and require different police officer populations. Interestingly, however, the states share the same general rate of available jobs versus total population. Employment per 1,000 jobs in Wyoming is 4.27 while employment per 1,000 jobs in California is 4.64. Overall, the states of California, Texas, New York, Florida, and Illinois have the greatest number of police officers working in the state. However, the list changes when employment per thousand jobs is considered. 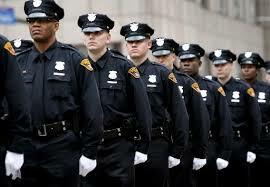 Nationwide, the District of Columbia has the greatest number of police officers per 1,000 jobs. Other states with the highest rate of employment when compared to the total number of available jobs include Mississippi, Alabama, New York, and Louisiana. Within a variety of states around the country, certain metropolitan areas offer a high number of jobs for police when compared with overall job availability. The BLS suggests the small metropolitan areas of Hinesville-Fort Stewart in Georgia, Prescott in Arizona, and Ocean City in New Jersey have the highest rate of employment per thousand jobs. In addition, major metropolitan areas with appreciable employment opportunities for police officers include New York, Los Angeles, Chicago, and Washington, D.C. Conversely, rural and small town areas that may offer significant employment opportunities include the Eastern Sierra Region and North Valley Region of California. As is not unexpected, different areas of the United States compensate their police officers at different rates. The value of a police officer’s salary may change based upon the cost of living in a metropolitan area versus a rural area, as well as the starting salary and the eventual maximum salary a police officer may obtain. Future police officers open to relocation to a city that needs new officers and which also pays well, the best city to consider is Los Angeles. Officers may expect an annual mean wage of $88,280 a year, and the Los Angeles metropolitan area also has a high need for officers. Nationwide, the mean annual wage for police officers is just below $59,000, and only the top 10% of wage earners will reach a salary that touches $90,000 a year. Law enforcement professionals enjoy the opportunity to work in nearly any geographic area of the United States; however, the BLS doesn’t expect rapid expansion of the profession in the next decade with slower-than-average growth for new jobs. Therefore, it may benefit a police officer to find metropolitan areas with a high demand for police officers to find work in a timely manner.